The start of the 2018 World Cup had everything millions of fans in Russia could wish for: Perfectly prepared stadiums, beautiful and short opening ceremony, and spectacular performance of the national team. The country has indeed come together and rejoiced in welcoming the greatest sport event, which will be watched with keen attention in every inhabited place on the globe. For eight years, 11 cities in Russia’s European part had prepared for greeting thousands of foreign tourists, and the joyful atmosphere in Moscow resembles the breathtaking opening to the world during the 1957 Festival of Youth and Students. Alexei Navalny, a defiant leader of “non-systemic” opposition, is amused at the beautification of the Moscow prison, which is miraculously transformed into a hotel-type establishment ready to accommodate over-enthusiastic fans. Yet, not far behind this joy loom reflections on the perfectly organized 1980 Olympics in Moscow, which marked the terminal decline of the Soviet Union accelerated by the war in Afghanistan, and on the spectacular 2014 Olympics in Sochi, which became a preamble to Russia’s brutal aggression in Ukraine. President Vladimir Putin is not a fan of the most popular game in the world but he is keen to exploit to the maximum its huge geopolitical resonance. 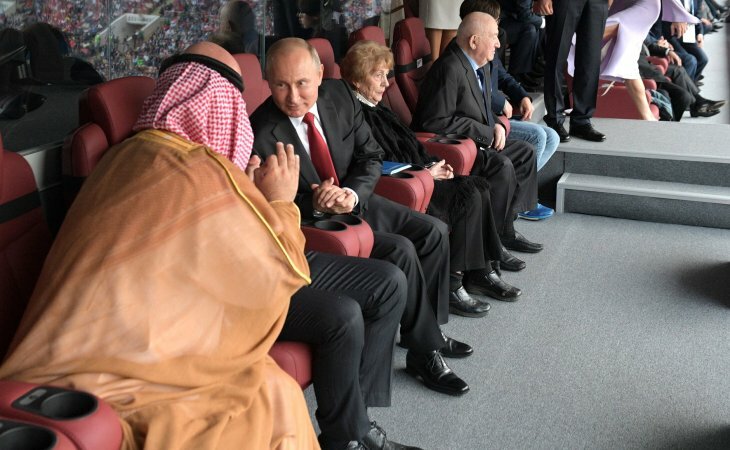 At the opening match, he showed all due respect to Saudi Crown Prince Mohammad bin Salman and expressed sincere surprise with the crushing victory of the Russian team. Indeed, for him it was a useful opportunity to discuss the plans for further regulation of oil production by the Russia-OPEC cartel, so that the price would stay in the “comfortable level” of $US 70-80 per barrel, as Igor Sechin, his oil-confidant and CEO of the giant Rosneft, has put it. Iran, Iraq and Venezuela have already raised objections against this Russian-Saudi deal-making. Russia cannot hope to recover the colossal expenses on building the infrastructure for the World Cup, but seeks to harvest the very diplomatic and propaganda dividend. The economic problems, however, do not take a break, and the government decided that the happy moment of the arrival of the long-awaited football party provides a perfect cover-up for the inevitable decision on raising the retirement age. There are worries that this painful hit on social benefits of millions of men (who have to work until 65 instead of 60) and women (who face even greater change from 55 to 63) may lead to protests. Putin has distanced himself from this act pushing the responsibility square on the government and reserving for himself an option of showing benevolence by adjusting the new rules by a year or two. What might have greater impact on business dynamics is the decision on an increase of the value added tax, which makes it impossible for the Central Bank to cut the key interest rate. Economic stagnation instead of the breakthrough prescribed by Putin remains the best prospect for Russia even with the “comfortable” volume of petro-revenues. Sobering up to these economic realities will happen already in the autumn, but presently Russia is happy to escape from the Western ostracism and forget about sanctions and wars smoldering in Syria and in Donbass. Putin, nevertheless, finds it important to combine the football diplomacy with demonstrations of Russia’s might. One of them is the large-scale exercises of the Northern Fleet, which sailed into the Barents Sea with 36 combat ships, auxiliary vessels and submarines, except for its only aircraft carrier Admiral Kuznetsov, which has started long repairs, and its flagship nuclear cruiser Petr Velikii, which awaits its turn for overhaul. This surprise show of naval power is quite possibly intended to reinforce the diplomatic warning to Norway that Russia is very displeased with its intention to invite USA to increase to 700 the force of Marines that are training in the northern fjords. A different demonstration is developing in the Sea of Azov, where Russia has re-deployed several missile ships from the Caspian Flotilla, while another one is announced in the Kuril islands, to much annoyance in Japan. This combination of “soft power” newly-gained from the game of football and “hard power” brandished in the newly-normal way is supposed to prove Russia’s high relevance on the international arena. What could confer credibility to these maneuvers is the prospect for Putin’s meeting with US President Donald Trump, and Russian mainstream media puts a heavy spin on this theme. The unprecedented row at the G7 summit, where Trump offended US allies in many unexpected ways, including by suggesting to return Russia to this club of democracies, is seen as very beneficial for the Russian cause. Trump’s success at the Singapore summit with the North Korean dictator Kim Jong-un is expected to pave the way for the equally high-profile summit with Putin. The Kremlin needs to find something to put on the table, and nuclear arms control is definitely a demanding issue for high-level talks. Moscow tries to move fast with various initiatives knowing that the uplifting effect of the good start of the World Cup cannot last long – and that the smooth course of the long tournament is by no means guaranteed. Even if no organizational setback or terrorist attack happens, the football party will be over by mid-July, and August is known as a bad luck month in the Russian political calendar. The exorbitantly expensive show-off will leave Russia with hangover fans, discontent past-middle-age workers agitated about their pensions, and deeply worried neighbors, who know full well the track record of Russia throwing big parties and continuing with smashing the regional order. In the four years since the Sochi Olympics, Russia has moved far along the track of economic decline and political despotism. It has gained much experience in executing “hybrid” interventions and is set to continue testing the limits of Western resolution to contain its export of conflict and corruption. Check also Eurasia Daily Monitor, June 18, 2018.